Although I started this piece last year, I returned to it this past summer, feeling compelled to add an additional branch to the first, as the lone branch hanging over my drawing desk seemed to be calling for a companion. I took the original photograph at a Hispanic food section in a grocery store that was filled with all kinds of fruits and vegetables that were unfamiliar to my diet, being both drawn to and repelled by the spiny protrusions that protected what must must have been fleshy fruit contained within the flat surfaces. After printing them out in one large image, I hand-carved the entire surface, defining the spaces between the spines with line and a sense of movement. Then began the work of cutting them out into discs, hoping to soften the bristled surface. 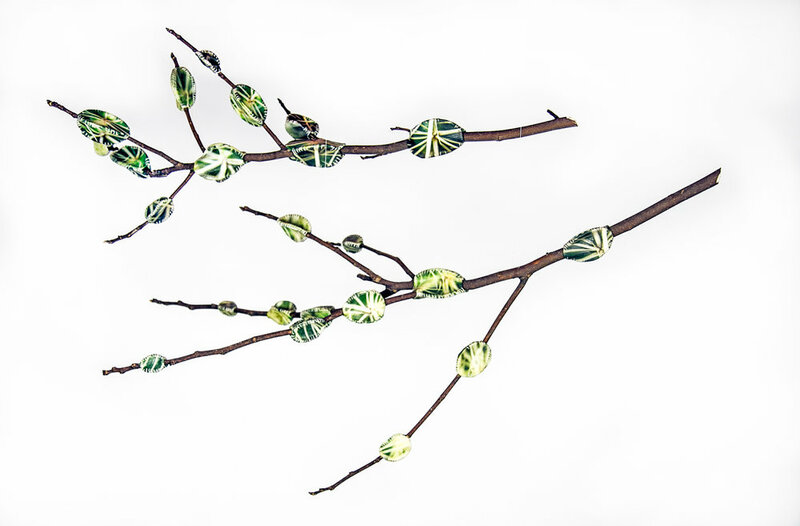 As each form became a pod that encapsulated the branch, a sense of satisfaction began to settle into my mind, and I smiled as I saw the forms multiplying. As often is the case in adhering my sculpture to substrates of any kind, there is an immense concentration and balancing as they come together, much like the pieces in our lives as we progress down paths. 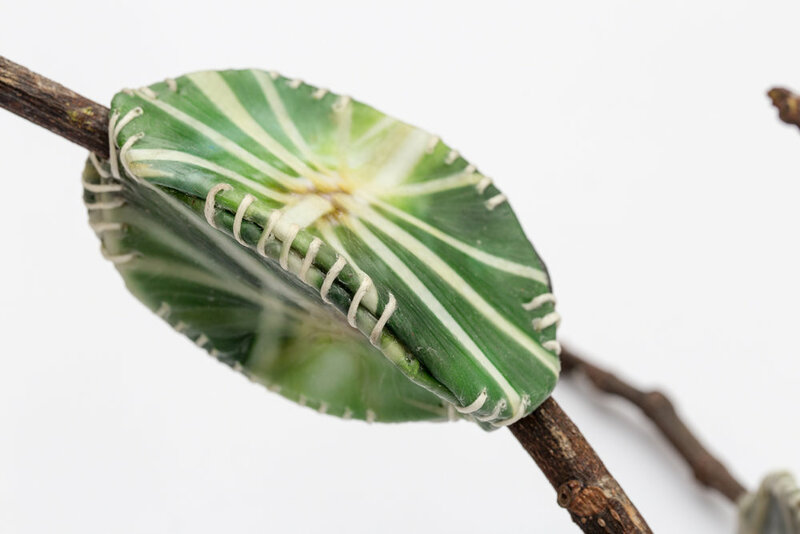 The biggest piece of insight, however, was that this suturing is intrinsic to how we live and grow each day, yet we often hide the very stitches that hold us together and allow us to function. I made a conscious choice during this construction that I was going to intentionally incorporate the stitches in much of my sculpture, allowing them to become part of the beauty of the form, visible for all to see. I felt empowered to enable this evolution into dimensional pods that became part of the branches, letting it remain unclear whether they emerged as an outgrowth of the branch or attached themselves from another source. 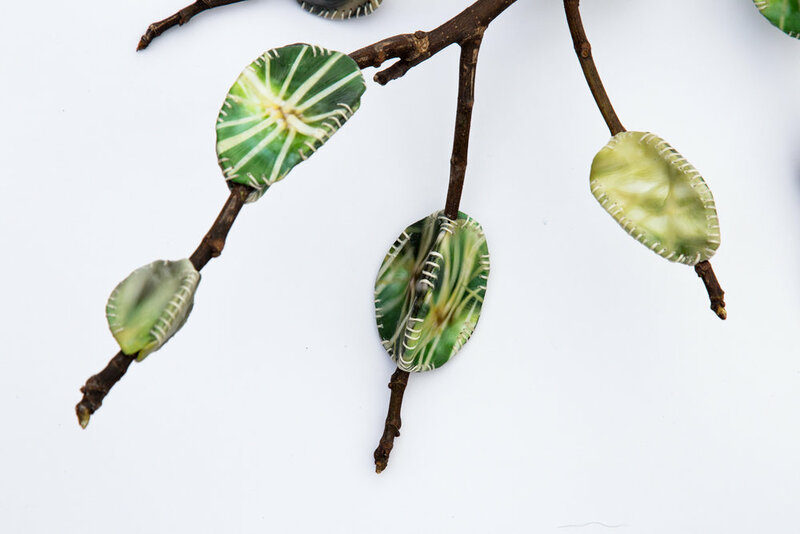 Like the pods, our lives are shaped by inner and outer experiences, a fascinating process when we can witness the beauty that can emerge when pushed beyond our boundaries, remain grounded to our core, and are supported by each other.